Lol, oh this made me smile Connie love that image and the sentiment a super make. Love it! Fabulous coloring. Love the addition of the glitter. Fun card, NanaConnie! What a sweet, cute card! Thanks for joining us at Inspiration Destination. Hope to see you again and good luck! Too cute! Love the kitten peeking around the pumpkin! I just love Bugaboo, too, and I really like a cute image on an all white card. Really shows it off. The glitter is a great touch! What a beautifull card, I love the way you coloured it ! Great fun image, as always. Love how you've kept this card so CAS. Thanks for playing at AAA Cards. Oh, what a nice card! How cute. Love the glitter as shading. Fantastic CAS card Connie! Love the placement of the sentiment and your coloring is wonderful! This is gorgeous Connie, love the kitty. what a fun card, love the image and your coloring is wonderful! 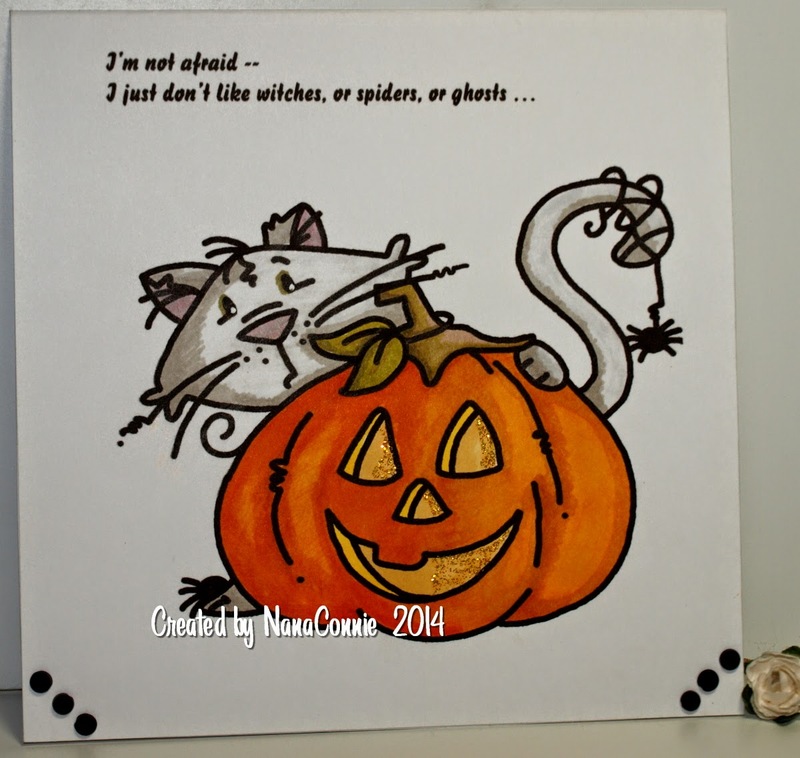 Anther gorgeous Halloween card a NanaC! I love the added glitter on the pumpkin, makes it look like it's lit up!! Very beautiful card! I like the image and the color and the idea of ​​the eyes of the pumpkin! Thanks for sharing with us at the Scrapper`s Delightts challenge! How fun- LOVE this sweet image and your coloring is Awesome! I am terrible with judging size and moving sentiments around when using digi's. Love the CAS design! Fantastic!! Great coloring. Love that image and the sentiment is great! Too cute! Thanks so much for playing along with us at Open-Minded Crafting Fun Challenges!!! Good Luck! I hope we see you again!! Adorable scarey cat :) Thanks for joining in at AAA! Such a happy card, love it. Thanks for joining our challenge at Ppinkydolls. Great CAS card Connie, love the touch of glitter. Thanks for sharing with us at Open minded Crafting fun. Very cute CAS card, NC! The image is so fun and I love the sparkle! Thanks for joining us for the Little Miss Muffet Challenge! So cute halloween card. Thanks for playing with Little Miss Muffet challenge this week. This is so cute! I love the sweet image. Totally love the great CAS look and the fabulous sentiment you have used for this!!! Absolutely perfect CAS Halloween card! I love how you've used the glitter in the Jack O'Lanterns eyes, nose and mouth. And the image together with the sentiment is just great! Thanks for joining us at Open-Minded Crafting Fun Challenges, Good Luck! Hope to see you soon again!